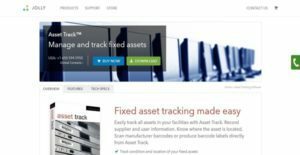 Asset Track is an innovative, robust, and simple asset tracking solution designed and developed by Jolly Technologies Inc., a software company that helps various companies and businesses easily track and manage all of their fixed and IT assets. The asset tracking software is ideal for both small businesses who have limited asset management needs and large companies that are dealing with multiple sites, products, and services, and complex requirements. Asset Track is trusted by technology, retail, and sales companies; government organizations, service providers, manufacturing companies, healthcare providers, sports franchises, financial institutions, transportation companies, educational institutions, entertainment companies, and non-profit agencies. The solution permits users to perform an audit of all of their fixed assets, allowing them to monitor their condition and location. Asset Track also has the capability to provide the depreciating values of fixed and IT assets. It enables users to track the employees and staff who borrowed their assets and equipment, and automatically notifies the borrowers when they need to return the assets. With Asset Track, companies and businesses will be able to conduct an audit of all of their fixed assets. Here, they can determine the number of assets they currently have. As they perform audits on a regular basis using a portable tablet, the software allows them to access information about the assets they are tracking which include location, condition, and custody. In addition, they can update asset information with ease as soon as they find the assets. They can also generate reports so that the management is notified of the assets that are missing or have been moved. The asset tracking software makes it easy for users to track the locations of their assets through the aid of its barcode or RFID scanning capabilities. Thus, the software permits them to tag their assets with barcodes or RFID. Tags assigned to assets can also be conveniently printed. To record the locations of assets, Asset Track enables users to scan the barcodes or RFID embedded on their tags or labels through the aid of a barcode or RFID reader. Reports containing information about checked out, missing, or misplaced assets can be emailed or exported as well. Asset Track provides users with the capability to manage depreciable assets. It is equipped with an array of standard depreciation formulas that they can select from and apply in order for them to accurately calculate the depreciation values of their fixed and IT assets. They can specify their own parameters and approaches when it comes to managing depreciation. They will be able to calculate and track the depreciated values of assets throughout a period of time, and keep records of depreciation history. In addition, the software permits users to come up with various depreciation reports which contain the original and deprecated values of their assets. Tools and equipment lending is another innovative feature available in Asset Track. With this feature, users will be able to have their employees and staff borrow their assets and equipment, and track these borrowers easily. By simply scanning a tool or equipment, they can access information about the person who borrowed it. This is because the software supports integration with Active Directory and other third-party software, permitting users to automatically identify the employees and staff who borrowed the tools or equipment. The borrower information that they can be accessed includes the date when the asset was borrowed and the date when it is supposed to be returned. For past due assets, the software permits users to automatically send reminders through email to those employees or staff who borrowed them. Asset Track makes sure that companies are able to keep detailed records of maintenance services and warranty-related information for all of their critical fixed assets. These records contain rich information such as asset type, serial number, part number, supplier, and cost. If you are considering Asset Track it may also be a good idea to examine other subcategories of Best IT Asset Management Software gathered in our base of SaaS software reviews. Each enterprise is different, and may need a specific IT Asset Management Software solution that will be designed for their company size, type of clients and employees and even particular niche they deal with. We advise you don't count on locating an ideal app that is going to work for every business no matter what their background is. It may be a good idea to read a few Asset Track reviews first and even then you should remember what the software is intended to do for your company and your staff. Do you require a simple and intuitive app with only essential functions? Will you actually make use of the advanced functionalities needed by pros and big enterprises? Are there any particular features that are especially useful for the industry you operate in? If you ask yourself these questions it is going to be much easier to get a solid app that will match your budget. How Much Does Asset Track Cost? Easily track all assets in your facilities with Asset Track. Record supplier and user information. Track where your assets are located. Scan manufacturer barcodes or produce labels with barcodes and RFID directly from Asset Track. Easily track all assets in your facilities with the Pro Asset Tracking System. This complete system provides everything you need to get started. Record supplier and user information. Track where assets are located. Scan manufacturer barcodes or produce barcode labels directly from Asset Track. Easily track all assets in your facilities with the High Volume Asset Tracking System. This complete system provides everything you need to get started. Record supplier and user information. Track where assets are located. Scan manufacturer barcodes or produce barcode labels directly from Asset Track. Easily track all assets in your facilities with the RFID Asset Tracking System. This complete system provides everything you need to get started printing and tracking assets using RFID labels and tags. Record supplier and user information. Track where assets are located. Scan manufacturer barcodes or produce barcode labels directly from Asset Track. We realize that when you make a decision to buy IT Asset Management Software it’s important not only to see how experts evaluate it in their reviews, but also to find out if the real people and companies that buy it are actually satisfied with the product. That’s why we’ve created our behavior-based Customer Satisfaction Algorithm™ that gathers customer reviews, comments and Asset Track reviews across a wide range of social media sites. The data is then presented in an easy to digest form showing how many people had positive and negative experience with Asset Track. With that information at hand you should be equipped to make an informed buying decision that you won’t regret. What are Asset Track pricing details? What integrations are available for Asset Track? If you need more information about Asset Track or you simply have a question let us know what you need and we’ll forward your request directly to the vendor.